Blarney castle is located in a beautiful natural site adjacent to the Irish town of the same name. From here, the second largest city, Cork, is only 9 km in the southeastern direction along the main road N20. Blarney has four main tourist attractions, mere castle, stone monument Blarney, Rock prison and the beautiful botanical garden. These attractions provoke Blarney to become one of the greatest treasures of Ireland, attracting thousands of visitors annually in the town and Blarney Castle. The original building at the Blarney Castle was built here sometime in the 10th century and was a simple blockhouse, the stone castle was built in 1210. As Blarney is today it is shaped by the famous Irish Lord Dermot McCarthy in 1446, who was King of Munster at the time. The castle remained a fortress of the family lineage to the arrival of McCarthy's violent invasion of Oliver Cromwell in 1646. Fifteen years later the English throne was to be crowned to King Charles II, who then returned it to the McCarthy Clan of Blarney. After Battle Combat, Boyne in 1690, all Irish chiefs lost their powers and the owners of the castle again were forced to leave. Blarney Castle was sold to Sir James Jefferyes, who was Governor of Cork in 1703. Today, the castle is managed by the local office of property management. The world famous Blarney Stone is situated high in the pinnacles of the castle. 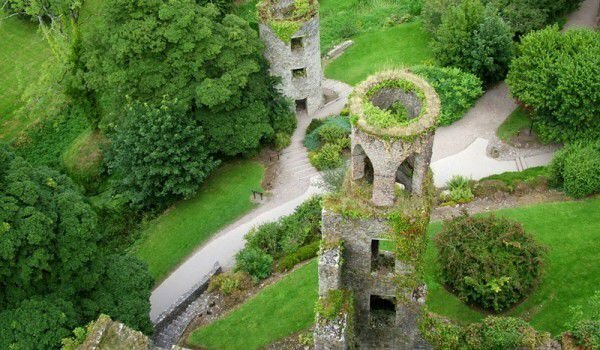 To get to it you can climb a spiral staircase to the top of the tower of Blarney, where is a beautiful picturesque scenery all around. It is believed that the stone is part of the popular Scottish rock. The Scottish kings had sworn on the rock because they believed it had magical abilities. There is a belief that you kiss the so called rock of eloquence then you will never be lost for words. Once you see Blarney Castle and kiss the stone of eloquence you should not forget to visit the prehistoric cave prisons and beautiful botanical garden, which is located around a new building in the land of the castle. The beautiful flower beds, extensive lawns, covered with shrubs and trees gradually descend to the lake and are an excellent place for walking and recreation.